(Bloomberg Opinion) -- Expect to hear a lot of hyperbole at an Apple Inc. event on Monday — I’m already dreading the hoopla — about the company transforming entertainment and news. (Is it, though?) One thing Apple isn’t likely to discuss is its growing conflicts of interest. The company plans to unveil a video service that will include TV series and movies backed by Apple and provide access to existing Netflix-like digital video services (but not to Netflix itself). Apple also plans a subscription service for an online collection of news publications and magazines. 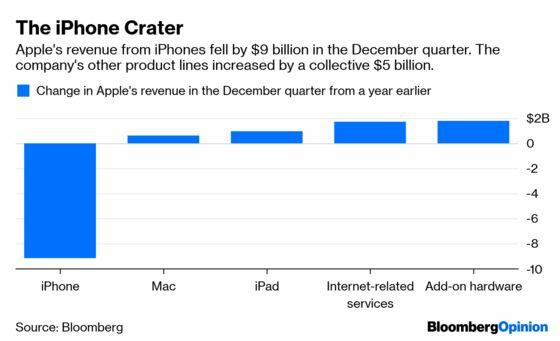 The announcements are part of Apple’s effort to push more add-on hardware and digital services to offset stagnating sales of iPhones, which generate 60 percent of Apple’s revenue. But there’s a catch. 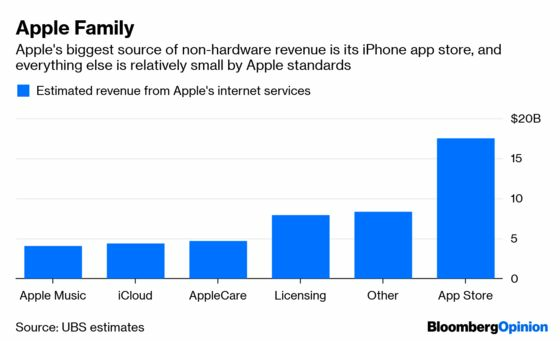 The more Apple creates its own internet services, the higher the likelihood of accusations that it will tilt the scales in favor of its own products rather than acting as a neutral seller of other companies’ apps and software. In short, Apple now has an Amazon problem. U.S. presidential candidate Elizabeth Warren and European regulators are asking hard questions about whether Amazon.com Inc. is conflicted as both the most important online mall for buying goods like Energizer batteries, Pampers baby diapers and Neutrogena skin moisturizer, and a seller of its own brands of batteries, diapers and moisturizer. Apple’s dual role as app distributor and app owner may not have the same regulatory interest, but some business partners are unhappy. Digital music company Spotify Technology Ltd. has loudly complained off and on — sometimes unconvincingly — that Apple is giving itself “an unfair advantage at every turn” with its competing Apple Music service. One of Spotify’s points is that, in theory, it would need to give Apple a 30 percent commission on each Spotify music subscription purchased in the App Store if it used Apple’s payment system. That would effectively inflate the cost of a Spotify subscription because Apple doesn’t have to absorb that expense for its own competing music service. Spotify chooses not to use the payment system, making it more difficult for users to buy a subscription. Spotify hasn’t given examples of other ways Apple leverages its power, but it’s easy to imagine. The Apple Music app comes installed with every new iPhone, along with several free months of subscription service, and that is a big advantage that Spotify, Pandora and other smartphone-reliant music services do not have. Apple knows the identity of all the people using iPhones, and it can push marketing to them for Apple Music. Spotify can’t. Apple also controls what apps are highlighted inside the App Store, and it could find ways to promote Apple Music or other Apple apps. What if, for example, Apple, with its own online television service to promote, puts its finger on the scales to disadvantage Netflix in the App Store? If the Wall Street Journal is part of Apple’s news bundle and also sells its own subscriptions through its iPhone apps, will Apple subtly nudge people to buy its subscription that includes the Journal, rather than the stand-alone Journal subscription? Will Apple, as it does for its music service, give months-long free trial offers for its video and news services — essentially billions of dollars in free marketing? This is not entirely new territory for Apple, but to my knowledge the company has never even acknowledged the possibility of tensions. Apple’s 1,100-word rebuttal to Spotify’s recent conflict-of-interest complaints did not address the music company’s criticism of Apple’s position as both a music app distributor and a music app owner. The more Apple makes its own digital products, the more it wades into these kinds of thorny conflicts. A possible “Netflix for gaming” from Apple is the thorniest of the thorny. About three-quarters of spending in mobile apps come from video games, according to App Annie. If Apple makes it own video game service, it may clash with the companies that are the most reliant on Apple for their livelihoods and generate huge commissions for Apple’s app storefront. Apple needs the revenue from its new digital services. But it may not be prepared for the headaches. The company's statement did say that Apple wants "more app businesses to thrive — including the ones that compete with some aspect of our business."